Starting a blog can feel overwhelming, but a lot of times we overthink the process and make it out to be more complicated than it is. You can start a website or blog for under $100 with just a couple weeks of prep work. I’ll break it down for you so that you can get going on your new hobby, business or side hustle in no time. It’s been over three years since I first started blogging. I’ve learned so much along the way on both how to run a blog (and an online magazine) and how capable I am of creating and working consistently at something that fulfills me. While it is a lot of work to run an online magazine and do all the promoting that goes along with it, it rarely feels like work to me. I’m passionate about becoming my best self and learning all there is about making your life even better, and I think if you find something that you enjoy talking about, blogging is a great way to pursue that. I’m sure there are a lot of you out there that want to make the leap and start a blog, and I want to help make it easier. Blogging has done so much for me, and I know it will for you too. Get out a pen and paper and get clear on why you want to create a blog in the first place. Who is your ideal audience? Who do you want to connect with? Why is this important to you? And why would people find this useful? What perspective do you have to offer? Are you passionate about the subject or are you just doing it because it’s a hot topic or you think you’re good at it? The best way to have a blog you keep up with is to talk about something you love and want to see more of in the world. Having a blog with a niche topic is ideal, but if you love talking about a variety of subjects, that shouldn’t stop you from starting. Recognize the talents you have and where you shine. Is writing your thing? Or do you do best on video? Taking great photos? Make sure you maximize your talents and let them shine in the website and blog you build for yourself. You want your brand to be representative of who you are and what you want more of in the world. Don’t be afraid to be different; just be as clear as you can about who you are. Most of us probably had those screen names (RIP AIM) in the early 2000s that we cringe when we think about them (like Tinkerbell22 or BbyGirlXo.) Don’t have your website be like that for you in five years. My first blog was like that for me and I still blush a little when I think about it. When in doubt, use your name or some variation of it. Be careful not to box yourself in to one thing when you start your website. 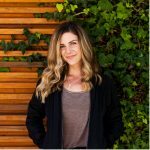 When Jordan Younger of The Balanced Blonde, first started her website, she called it The Blonde Vegan. She eventually boldly decided to quit veganism, and with a tie to a name with vegan in the title, that obviously made it more difficult for her moving forward with her brand. She upset lots of readers who boxed her into being a vegan blogger. She ended up changing the URL, but it was a tough and lengthy process I’m sure. Think about a name that will last a while and you won’t have to change it or a create a new website in a years time. Get the social media handles on all accounts, even ones that you’re not sure that you’ll use. It makes it easier for people to find you and you won’t want to try to grab a URL from someone in the future. Do some research to see if the URL you’re looking for is taken. After you decide your name, you’ll have to pick a platform where you’ll blog. – Do you plan to just have a blog? If yes, I’d recommend WordPress. – Do you plan to have a website with services with a blog included? If yes, I’d recommend Squarespace. There are more options out there. Blogger and Wix are two other options. You may want to do more research to make sure another platform isn’t what you’re looking for, but from my experience and what I’ve heard from fellow bloggers is that WordPress and Squarespace are the two best options. WordPress is extremely search engine optimization (SEO) friendly, which means that it’ll be easier to rank in Google search results for example. It’s pretty easy to navigate, but you may need to code a bit or find a theme that makes navigating the coding easy. When you come up with any problems on WordPress, Google search is your best friend. All the information you need is available to learn online. You can teach yourself as you go. Squarespace is very easy to set up and has crisp, clean templates that look amazing. Most people have the same layouts, and it looks less customized to me, but it’s sleek and makes any website look fantastic with minimal effort. One of their excellent features is that you can build a website with a free trial before committing to it. For WordPress you pay for the host, theme and domain, whereas Squarespace will charge you a monthly fee of $12-$26 per month on top of the hosting and domain fees, depending on the plan you go with. WordPress ends up being a more affordable option, but Squarespace may be worth the price (and still doesn’t break the bank) if you’re looking for more simplicity. After you set up your website on your platform, you’ll want to choose a host to run your blog on. It will allow you to have a .com website, which makes you look much more credible than having a .wordpress.com URL. It’s fairly inexpensive, but will be a recurring cost of creating a website. We use Bluehost as our host for now and haven’t had any issues with it. From what we’ve heard from other blogger friends, we’d also recommend SiteGround. While we’ve not personally used them yet, we’ve heard they have great customer service and fast speed. There are tons of hosting options, but I find that these two are the most common for new bloggers. Domain names costs will vary, but it will cost you about $15/year and hosting may cost you around $8/month. If you choose to go with WordPress, you can find great themes for $30 or so. Pick a responsive theme that will look good on both mobile and desktop layouts. Theme Forest is a great resource for amazing themes for WordPress. I’m all about branding, and investing in it is totally worthwhile. But when you’re starting out, don’t worry about getting professional help. You can find amazing fonts on Creative Market for very cheap and they offer new free fonts every week. It’s a fantastic resource for bloggers. If you can’t take your own photos, you can find great stock photos for free on websites like Unsplash, Pixabay and Pexels. For creating graphics, Canva is our favorite resource. You can always redesign and have someone professional help you later on. I think we often focus too much on having everything done perfectly and it doesn’t have to be that way when you’re getting started. Have three to five posts ready to go before you launch and tons of ideas written down. I’d recommend starting with three published blog posts, so that people who go to your website on the day you go live will understand what you’re all about and if they should come back again for more advice on what you’re specializing in. I’d also brainstorm 20+ posts that you can write about. You might not write all of those right away (or ever) but it shows that you can keep writing long term and have a lot to say on your niche. You don’t want to be struggling to create content. When writing, speak like a human, while keeping in mind that your headlines and text should be SEO-friendly. Think: How might my audience search for this content? What words would they use? Keep keywords associated with your topic in mind and using them throughout your writing, while still keeping your voice. On that note: You might not know what your voice is when you first get started blogging; that’s okay. Starting something new is all about experimenting and finding out what feels like you. Don’t worry about it being perfect; just start with what you have. You’ll likely laugh at your old content in a few years and that’s natural. An about me page, a contact page, and social media links are musts. You want to make it easy for someone to learn about who you are and reach you via email and social. Do some research on other blogs to get an idea on what to include, but be sure to make them your own. Having a unique blog style will get you much further than copying what everyone else is doing. The most important thing that I learned from starting a blog is not to take myself and blogging so seriously. It’s still something I struggle with, but when you research starting a blog, you’ll discover a lot of “rules” and the biggest rule I can offer you is that there are no rules. There’s good practices, sure, but ultimately, do what makes it fun for you. Some of the best bloggers and entrepreneurs out there were rule breakers. Don’t be afraid to do things differently, and make sure you’re loving the process.